← Historical Markers Part of Improvements Planned for Mill Creek Park. SANDWICH — The owners of NRG Energy Canal Generating Plant will allow an archaeological dig on land once owned by one of the town’s earliest settlers. Bourne resident Jack MacDonald had appealed an April 13 decision by the Sandwich Old King’s Highway District Committee granting a permit for a 1.5 megawatt ground-mounted solar array on the property known as the Freeman Farm. 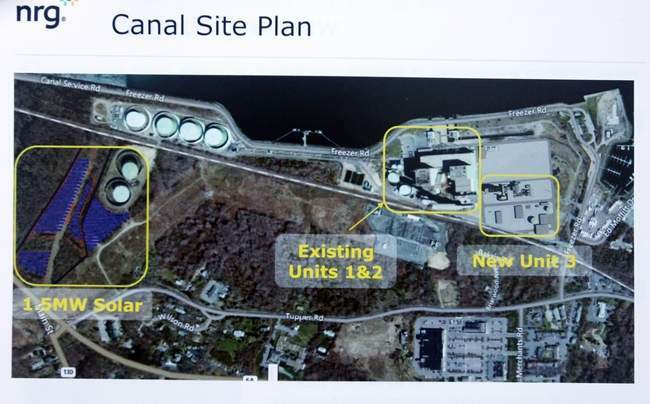 The property is located just over the town line with Bourne, adjacent to fuel tanks on NRG property. The agreement to allow the focused dig was reached Tuesday as MacDonald was set to argue his appeal before the Old King’s Highway Regional Historic District Commission. The property is where Edmund Freeman Sr., one of the 10 men of Saugus who settled Sandwich in 1637, lived and farmed, though the site of his house is not clear from records in the town archives. A farmhouse that burned at the location in 1982 and where the dig will occur dates back to the late 1800s. Freeman and his wife, Elizabeth, are buried in a tiny burial ground known as the Saddle & Pillion Cemetery. The site, which is preserved, is on a hill across Tupper Road from the NRG property, which can be seen through the trees. NRG officials had given verbal assurances they would allow exploration at the site on the company’s property before last month’s vote, but MacDonald has now secured permission in writing. “It’s a win, win, win, and throw in a couple more wins,” MacDonald said Tuesday morning. James Wilson, an attorney for the regional commission, confirmed MacDonald had withdrawn his appeal. NRG is “pleased” to be able to move forward with the project, David Gaier, a spokesman for the company, wrote in an email. At the April 13 meeting, NRG officials explained they were facing a tight window because some of the government-based incentives that make the solar project financially feasible are due to end. “We’ve mutually agreed to several things that satisfy both parties, and allow NRG to move forward with a project that helps Massachusetts continue its leadership in renewable, clean energy,” Gaier wrote. The archaeological survey can’t be completed until after NRG receives its building permit for the solar project, according to the agreement. With the help of Plimoth Plantation, MacDonald found David Landon, associate director of the Fiske Center for Archaeological Research at the University of Massachusetts Boston, who is interested in doing the dig. Freeman not only helped to settle the Cape’s oldest town, but served as assistant governor from 1640 to 1645 under Gov. William Bradford, a tie to Plymouth that likely piqued the Plantation’s interest. MacDonald’s interest was cultivated during his childhood growing up just over the town line in Sagamore, where his family would talk about Sandwich’s rich history and, particularly, Freeman’s links to it. When he heard about NRG’s solar project, he worried some of that history might be lost. “We don’t know for sure if it’s the site, but it’s certainly worth taking a look,” MacDonald said. This entry was posted in Archaeology, Articles, Current Events, History of Sandwich, News. Bookmark the permalink. I’m a Freeman a decendant of Edmund directly through his sons Edmunds lll Vl and V through his son Nathaniel Freeman and his son Rev Frederick Freeman. I am proud to have their blood running through my veins.